The evaluation and support system consists of multiple measures to paint an accurate and comprehensive picture of teacher performance. All teachers will be evaluated in four categories, grouped in two major focus areas: Teacher Practice and Student Outcomes. The annual evaluation process between a teacher and an evaluator (principal or designee) is anchored by three performance conversations at the beginning, middle and end of the year. The purpose of these conversations is to clarify expectations for the evaluation process, provide comprehensive feedback to each teacher on his/her performance, set development goals and identify development opportunities. These conversations are collaborative and require reflection and preparation by both the evaluator and the teacher in order to be productive and meaningful. 1. Orientation on Process – To begin the evaluation process, evaluators meet with teachers, in a group or individually, to discuss the evaluation process and their roles and responsibilities within it. In this meeting, they will discuss any school or district priorities that should be reflected in teacher practice goals and student learning objectives (SLOs), and they will commit to set time aside for the types of collaboration required by the evaluation process. 2. Teacher Reflection and Goal-Setting – The teacher examines student data, prior year evaluation and survey results and the Connecticut Framework for Teacher Evaluation and Support to draft a proposed performance and practice goal(s), a parent feedback goal, student learning objectives (SLOs), and a student feedback goal (if required) for the school year. The teacher may collaborate in grade-level or subject-matter teams to support the goal-setting process. 3. Goal-Setting Conference – The evaluator and teacher meet to discuss the teacher’s proposed goals and objectives in order to arrive at mutual agreement about them. The teacher collects evidence about his/her practice and the evaluator collects evidence about the teacher’s practice to support the review. The evaluator may request revisions to the proposed goals and objectives if they do not meet approval criteria. 1. Reflection and Preparation – The teacher and evaluator collect and reflect on evidence to date about the teacher’s practice and student learning in preparation for the check-in. 2. Mid-Year Conference – The evaluator and teacher complete at least one mid-year check-in conference during which they review progress on teacher practice goals, student learning objectives (SLOs) and performance on each to date. The mid-year conference is an important point in the year for addressing concerns and reviewing results for the first half of the year. Evaluators can deliver mid-year formative information on components of the evaluation framework for which evidence has been gathered and analyzed. If needed, teachers and evaluators can mutually agree to revisions on the strategies or approaches used and/or mid-year adjustment of SLOs to accommodate changes (e.g., student populations, assignment). They also discuss actions that the teacher can take and supports the evaluator can provide to promote teacher growth in his/her development areas. 1. 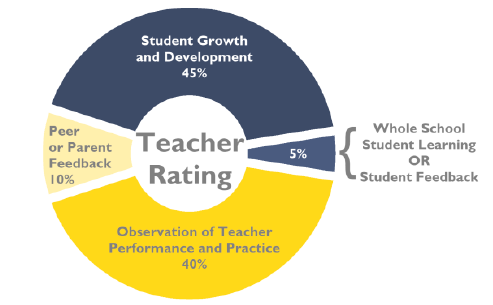 Teacher Self-Assessment – The teacher reviews all information and data collected during the year and completes a self-assessment for review by the evaluator. This self-assessment may focus specifically on the areas for development established in the goal-setting conference. 2. Scoring – The evaluator reviews submitted evidence, self-assessments and observation data to generate category and focus area ratings. The category ratings generate the final, summative rating. After all data, including state test data, are available, the evaluator may adjust the summative rating if the state test data change the student-related indicators significantly to change the final rating. Such revisions should take place as soon as state test data are available and before September 15. 3. End-of-Year Conference – The evaluator and the teacher meet to discuss all evidence collected to date and to discuss category ratings. Following the conference, the evaluator assigns a summative rating and generates a summary report of the evaluation before the end of the school year and before June 30.